And so, in the arterially clogged history of light lunches, we enter the post-Grenvyle era. It won't, it can't be the same. If we're heading out of town, who's now gonna be mug enough to drive? Our travel restricted by the Icelandic volcano, we're meeting up next to Iceland frozen foods. 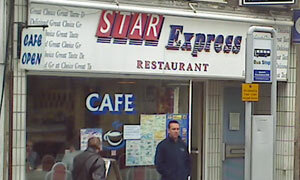 As it happens, I recall that our dearly departed colleague pre-visited today's venue, the Star Express, popping in for a crafty cuppa while waiting for a bus. He said as much while we sat in the sun's rays outside the Sunrise, a mere scone's throw over the St Matthews roundabout. Here, in the old Newsteads premises, all seats are inside and are firmly fixed to the floor. Layout is long and thin, a la Al's. When I swan in, Andy's clearly on a timetable and ploughing headlong into his grub. There's no shortage of menus -- three different laminated beauties, paying homage to Little Chef, one for breakfasts plus two others. Stunned by the choice (compare & contrast Origo), I copy Andy and go for the egg & bacon baguette, enhanced by the non-branded squeezy condiments. Accompanying thick banana milkshake, available in a trio of sizes, is surprisingly good and delivered with a cheery smile. Talk is of A's walk to work (one of the 50 ways) earlier in the week, through the woods, along the UFO trail and straight on 'til mid-morning. While he's busy sketching his route on a bit of scrap paper, I return to the counter to order coffee, obviously, with pancakes and maple syrup. Had I consulted the desserts menu more closely, I'd have had to try the brown derby -- ice cream on a doughnut? Eye was also bruised by the grocer's apostrophe of "PARTIE'S". Nice. Pancakes put down and syrup slurped, I'm glad of the digestive possibilities offered by the ride home. If it was a car -- Morris 1100. If they were passing by -- Kerry Katona.